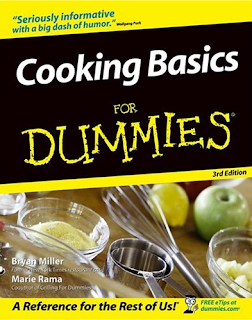 Cooking Basics for Dummies! This book is great because it is really basic. If the recipe tells you to thinly slice an onion, you can turn to an illustrated page that shows you how to slice an onion. Really basic. Last night I made a simple dinner of a salad and an entree using recipes from the book. It was one of the best meals I've cooked in recent memory. Nothing got burned and it wasn't too salty or oily. But it took a looooong time to make it. I wanted to follow the recipe exactly because I have a tendency to miss important steps like adding essential ingredients or reducing the oven temperature. So I chopped and sliced at a snail's pace, reading and re-reading every word, without wandering off to watch television or play with the cats while my food cooked in the oven. At first I felt ridiculous taking so much time to make a simple meal and told myself repeatedly that I should be able to do it faster. But eventually I relaxed and let myself enjoy the process of cooking a careful meal for myself, and that might have contributed to it tasting so good. Isn't it funny how we value speed? I'm beginning to think it's highly overrated. 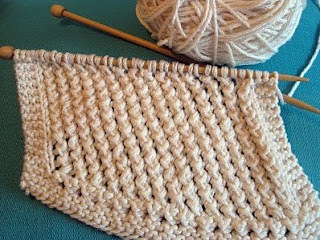 I am constantly trying to figure out how to knit more quickly, but maybe the trick is to learn to enjoy doing it slowly, to savor each stitch, each row, each little chunk of time dedicated to creating something with your hands. The instructor who taught my first sock class told us that whether we knit tight or loose, we should make adjustments to the pattern rather than trying to change the way we knit. I thought that was great advice for life in general. Acceptance. Not trying to change yourself. Being present to who you are and how you do things and not judging whether you should be faster or slower or tighter or looser. Tonight I'm going to attempt to cook another meal, so I'll see if I can put that in to practice. Good for you to get back into cooking! Have you started your ATC for Dec ??? I'll start next week..have the idea in my head.. I think you may have something there... I am always rushing - to work, to get my marking done, to get projects finished. I don't cook very often because "I don't have time" but maybe I should make time. Good to slow down. Thanks for the reminder. Rush, rush, rush is what we all tend to do each day. How nice that you are cooking and taking a different view point to the whole process. I will still leave that task to My Guy. I love doing the dishes. I need to slow down with my knitting. I seems to start and then hurry to finish. Oh my. A great post Stacy! Good for you for slowing down. I find I love the projects that I take my time on and enjoy -- so much more fun! Sounds like you are making some important decisions:) Enjoying the moment and slowing down! Have a blessed evening my friend, happy cooking! HUGS! Slow knitting. Finally, a trend I can be on top of! I tend to do everything fast-- and, yes, I miss essential ingredients. In theory, I love the idea of slowing down. But there is so much that I want to do in life! Very thoughtful post. And great practices if you can keep it up. I love that line from John Lennon's song "Beautiful Boy." Yes indeed! Nothing is impossible if you just slow down and take your time to accomplish it. yes. what did you make, Stacy? Cooking is fun but I tend to make the same things over and over and I get bored with it all. I don't like to buy "fancy" ingredients because sometimes it just goes to waste. keep us posted on your cooking adventure! Love your post. I too think I should knit faster so am going to try and slow down and just enjoy. Hope your cooking goes well. I cook for a hobby and find a lot of pleasure in the whole process- plus I love to eat.